I got out of my car and walked up to the parade grounds where large numbers of Canada Geese often forage. And while I was expecting quite a few geese I was surprised by the sheer number present. The entire southeastern quarter of the parade grounds was a carpet of geese! I sighed, set my scope up, and started scanning. It didn’t take long to find the one goose that didn’t look like the others and I had my Anser albifrons for the year. Eventually a bunch of the Canada Geese took off and flew over to the lake and the specklebelly went with them. 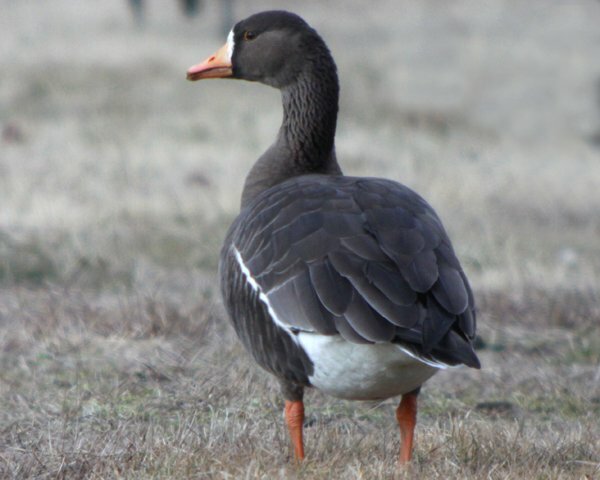 I birded around a little more and then made my way down to the lake where I reconnected with the Greater White-fronted Goose. 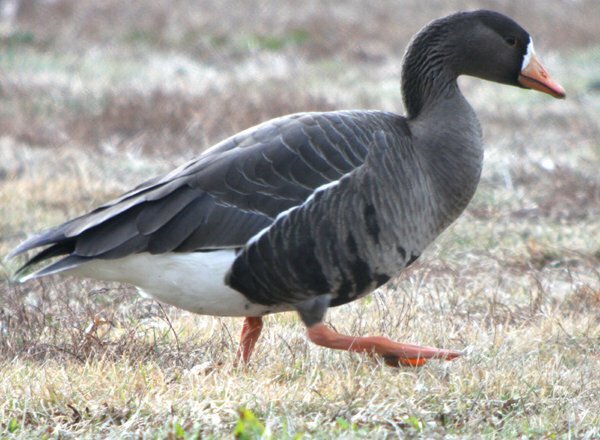 If you want to learn a whole lot more about Greater White-fronted Geese, especially the west coast population (and see some great pictures), check out Larry’s post from last week. Great sighting Corey! 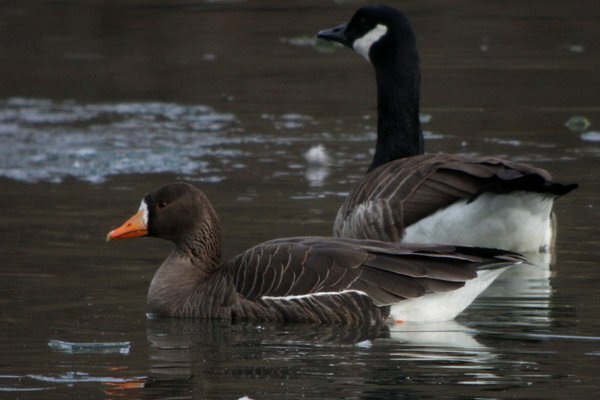 These Greater White-fronted Geese are very difficult to distinguish one sub-species from another. 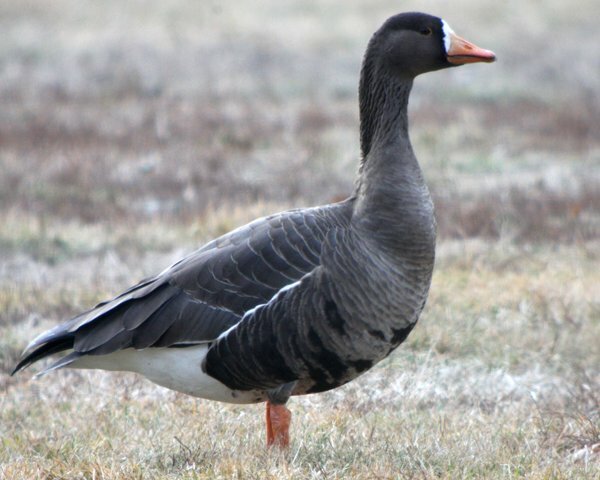 I will be looking for the Tule Goose “elgasi” on my next couple of excursions. You got some great shots of this goose. 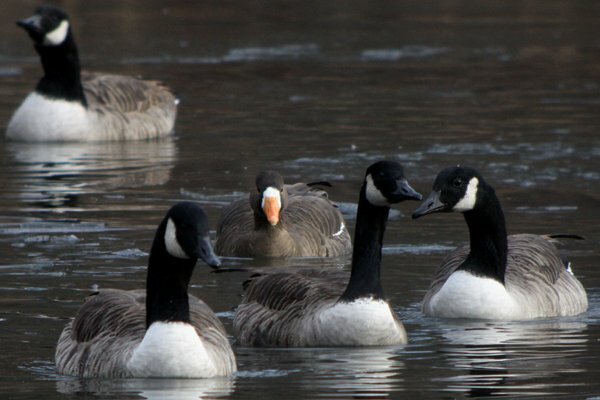 It’s weird to see a single Specklebelly hanging with a flock of Canada Geese! Looks okayish for Greenland, but the breast and belly should ideally be a bit darker. Furthermore, a clearer shot of the tail would help. The problem seems to be that orange-billed birds show up all around the US that are clearly not Greenlandish and I guess we’ll never truly know until someone looks at the birds on their breeding grounds. Oh yeah: seeing as you are from Queens, you surely don’t want to put a bird on your year list you saw in the Bronx?! Surely not? I mean hey, it could very well have flown over from Staten Island, or – gasp – even from New Jersey!? Having said that I’m unfamiliar with birds that might originate from the western flyway so I’ll agree with Jochen’s note of caution but east coast surely suggests a Greenland origin is much more likely. @Jochen: This goose is the least of your problems – I leave for Florida today! @Corey: oh yeah? And after Florida? Just you wait until my trips start, just you wait! Where Are You Birding This First Weekend of February 2016?